Can the Seahawks repeat as Super Bowl Champs, can the Niners get over the hump to the promise land, can the Cards get in the postseason this season & can the Rams overcome losing QB Sam Bradford once again? 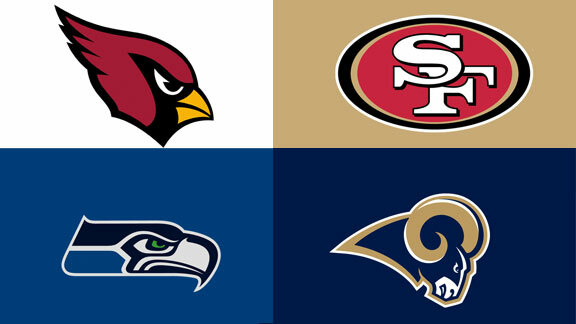 In the NFC West the following questions is asked, Can the Seahawks repeat as Super Bowl Champs, can the Niners get over the hump to the promise land, can the Cards get in the postseason this season & can the Rams overcome losing QB Sam Bradford once again. Lets take a look. The Seahawks haven’t lost much in the offseason & the way the defending Super Bowl champs looked in the pre-season, the Seahawks haven’t stop rolling. The Seahawks at home are almost unbeatable(except the Cards last season). The key is can Russell Wilson take another step into being a top QB, if the so the Seahawks could make 2 trips to Arizona, not 1 to repeat as the Super Bowl Champs. The Niners have some issues going into the Regular Season, LB Aldon Smith is suspended for 9 games, WR Michael Crabtree having Calf & Hamstring injuries, DE Ray McDonald with personal issues/arrested over an alleged domestic-violence incident Sunday, QB Colin Kaepernick struggling in the pre-season & Owner, GM & Coach Jim Haraburgh are not on the same page. What that being said the talent of the 49ers are good enough to overcome some things, but can the Niners get over the hump & now also get over the Seahawks to get back to the Super Bowl & win it all. The injury to DT Darnell Dockett was a blow for the Cards on defense, but they should be fine. The key on offense is to protect QB Carson Palmer & keep him upright. I think the Cardinals will be in the hunt for a playoff spot, but sadly the NFC depth could again cost the Cardinals a playoff spot, just like last season at 10-6. QB Sam Bradford is gone for the season again with another key injury, QB Shaun Hill comes from Detroit to start now instead of backup, the Rams defense will be very good & keep the Rams in alot of the games in the 4th Qtr, the key is can the Rams offense get it done, if so we could have all 4 teams in the NFC West going for playoff spots.